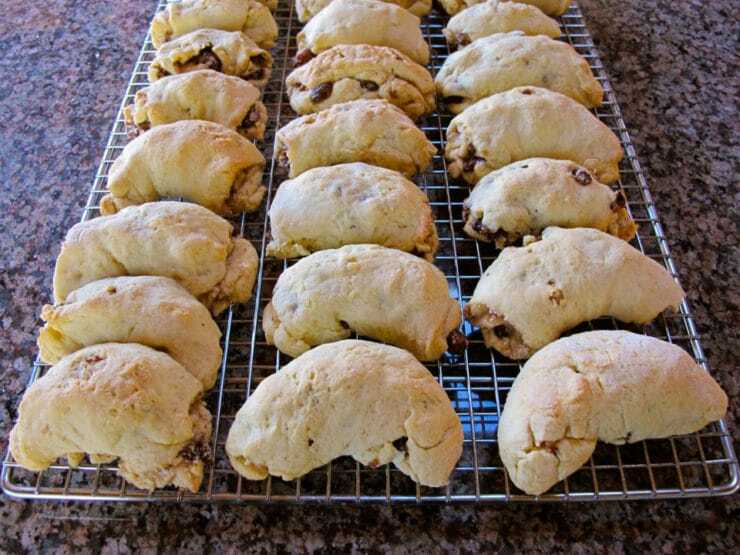 What makes a rugelach recipe “traditional”? Is it the dough or the filling? Is it how the rugelach is rolled and shaped? Which rugelach is the “right” rugelach? Every family’s answer will be slightly different, and they will all be right. Any recipe passed down through the generations can be considered traditional, no matter how different it might seem. Case in point– Erika’s “Unorthodox” Rugelach. They’re made with a pareve, delicate, dairy-free dough unlike many other recipes. They’re rolled the opposite way that rugelach is usually rolled. The filling is a loose combination of nuts, sugar, and raisins instead of the more common spreadable fillings. But none of that really matters. These rugelach are traditional for Erika, and when she bakes them for her family, they fill her kitchen with sweet memories. My friend Erika Kerekes writes a fabulous cooking blog called In Erika’s Kitchen. She’s a multi-talented home cook, social media maven, and all around swell gal. Some of you might remember Erika’s Smoked Paprika Chicken, which she shared with me a while back. Erika is single-handedly responsible for getting me hooked on smoked paprika, so you can thank her for inspiring the multitude of smoky recipes on my website. I recently asked her to share a family recipe with me. After bouncing some ideas back and forth, we settled on her grandmother’s rugelach. They aren’t like any rugelach I’ve ever made, but that’s what makes them special. Erika’s maternal grandmother, Rose Chankin Sharron, made these rugelach once or twice a year in her little kitchen in Queens. She would make several batches, wrap them up and hand-deliver them to family members. Erika remembers her mom sticking them in the freezer to keep the family from eating them all at once. They soon discovered that the rugelach tasted really good frozen, too… which meant the cookies never lasted very long in their home. I visited Erika a few weeks ago for an afternoon of baking and “kibitzing” around the kitchen table. Her mom Susan Penzer was in town, and we were able to discuss the family history behind these cookies at length. I asked them about the roots of their beloved rugelach. 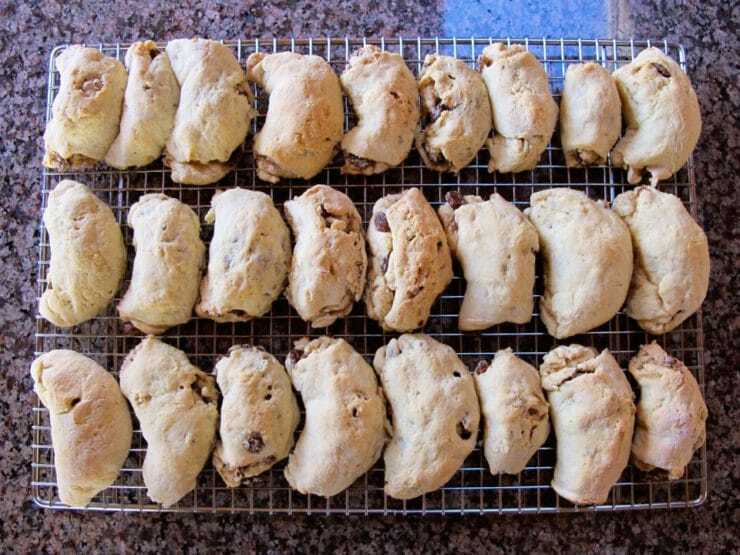 On Erika’s blog, she calls these cookies “Rose Sharron’s Unorthodox Rugelach.” I’ve renamed them “Erika’s Unorthodox Rugelach,” because it’s clear this cookie has become a celebrated tradition in Erika’s immediate family. On my visited I watched as she rolled the dough with care, gently pressing the loose filling into the center, then carefully slicing and shaping the cookies. As she worked, her son Emery came into the kitchen and watched the process. 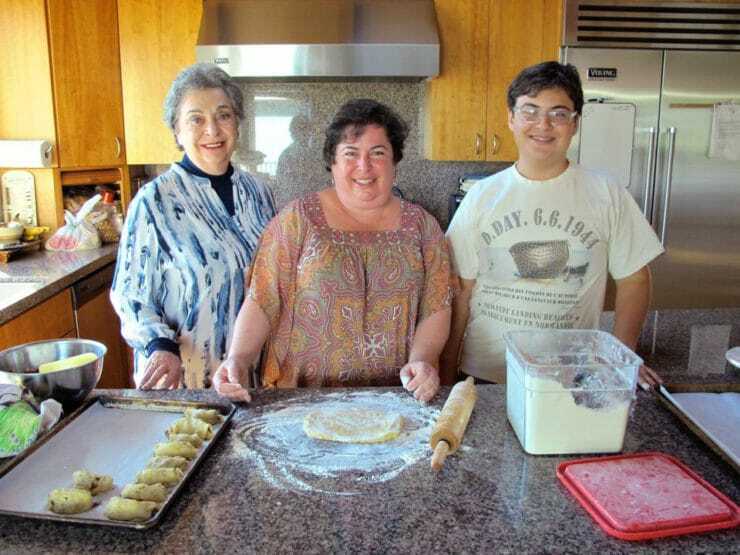 Emery has caught the cooking bug from his mother, which means that Rose’s rugelach will eventually be passed down to yet another generation. While the cookies were baking, filling the air with sweetness, Erika took out a folder of photocopied handwritten recipes. Erika received the recipes when Rose passed away in 1996; she keeps them on a shelf in her kitchen. 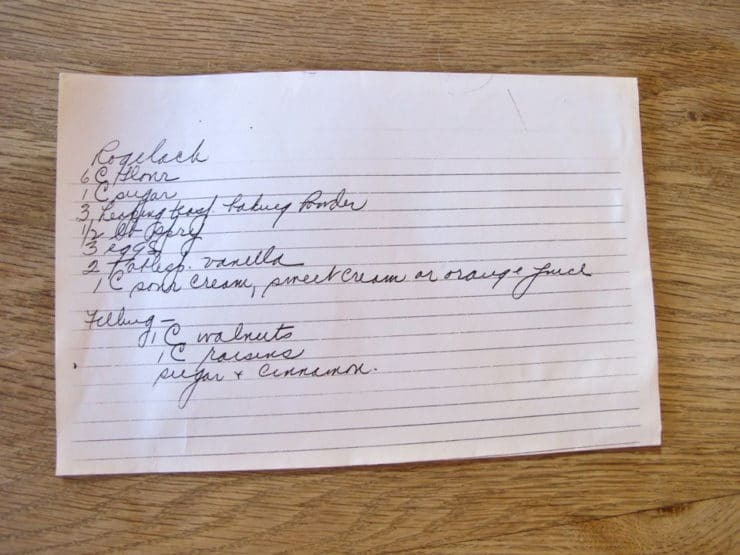 The famous rugelach recipe (spelled “Rogelach” on the recipe card) has only a list of ingredients, with no directions or even hints for the cooking process. Erika only made these rugelach once with Rose while she was alive. After she passed, Erika struggled to recapture the method that would produce her grandma’s famous cookies. The lack of details on the recipe card made things difficult. Erika’s friend Anne helped her to troubleshoot the dough, which is very delicate and harder to work with than dairy-based rugelach dough. In the end, they were able to crack the code, and now Erika makes these rugelach for her family a few times a year. As we sipped coffee and nibbled on freshly baked rugelach, we flip through the precious pile of photocopied recipes—kasha, meatloaf, blintzes. There is even a card with instructions for How to Clean Your House. Grandma Rose’s spirit is alive and well in these unorthodox little cookies. Thank you to Erika of In Erika’s Kitchen for sharing the recipe, and her kitchen memories, with all of us. A family recipe from Erika Kerekes of In Erika's Kitchen. A unique twist on rugelach. Pareve, dairy free dough. Cinnamon raisin filling. Kosher. Sift together the flour, baking powder and salt. Reserve. Cream the shortening and sugar together with an electric mixer until fluffy. Beat the eggs into the sugar and shortening, one at a time, until well incorporated. Mix in the vanilla. 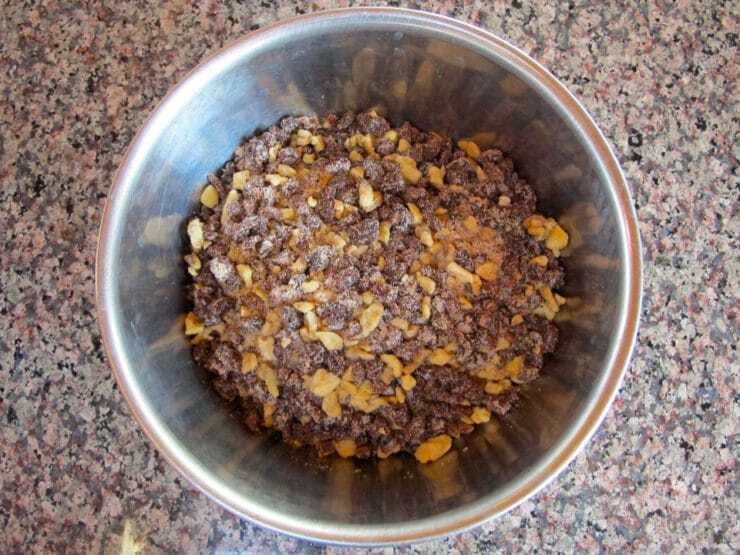 Add the dry ingredients and orange juice alternately, mixing after each addition, till the dough is uniform. It should be soft, not stiff. Refrigerate the dough for a few hours, up to overnight. Toast the walnuts in a nonstick pan over medium high. When they start browning and becoming fragrant (don’t let them burn! ), remove them immediately from the pan and place in a food processor. Add the remaining filling ingredients to the processor. Pulse a few times till the nuts and raisins are chopped smaller. Stop long before they turn into a paste… you still the filling to be loose with texture, without any overly-large nuts or chunks. Preheat oven to 400 degrees. Generously flour a rolling surface. The dough will be very sticky and soft, even after refrigeration, and will require a lot of flour to keep it from sticking as you roll. Take a dough ball the size of a lemon and coat it with flour. 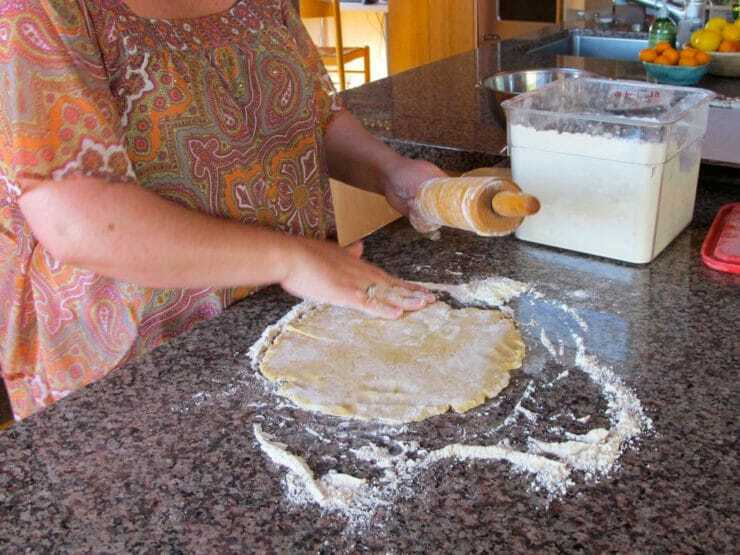 Roll it out with a floured rolling pin as thin as you can to form a rough circle. You want the dough thick enough to roll into cookies and hold the filling, but no thicker than that. 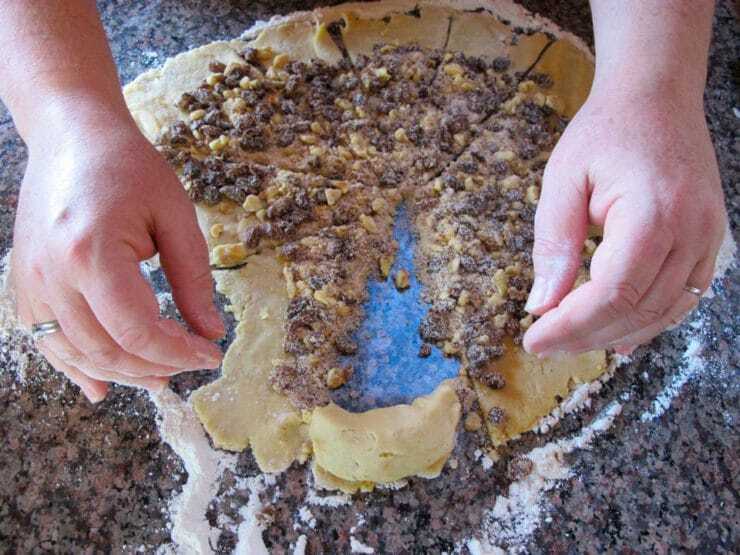 Sprinkle 2-3 tbsp of filling into the center of the dough circle, forming a large circle of filling in the center with a rough 1-inch border of dough around the edge. Use the rolling pin to lightly press the filling into the dough (don’t press too hard or you’ll tear the dough). Using a pastry scraper, pizza cutter or sharp knife, cut the circle into eight wedges. Roll up each wedge from the center point to the outer edge (seems backwards, I know, but with this type of filling rolling them the other way won’t work). 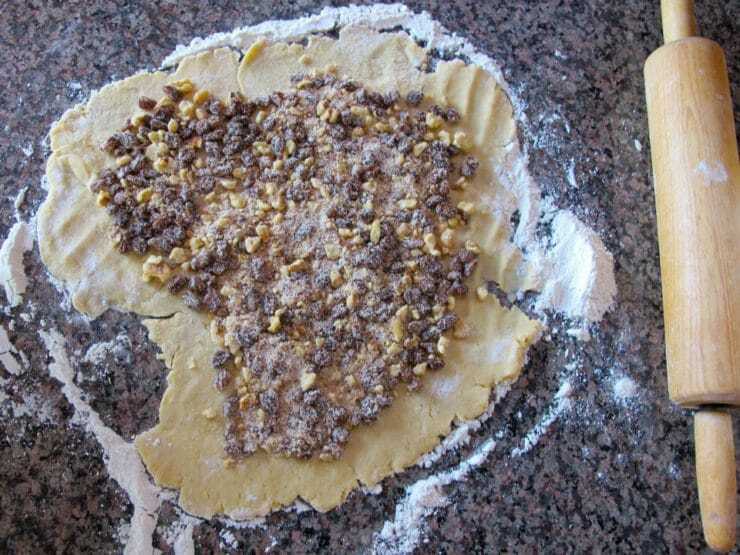 Use your fingers to gently shape the rolled-up dough and create a crescent shape. Don’t worry if some of the filling falls out as you roll… this is normal. Place the rolled rugelach onto a baking sheet, evenly spaced (the cookies will spread a little, but not much). Repeat the process in batches with the remaining dough till it’s gone. The dough is quite delicate and somewhat tough to work with, so be patient… it will take some time to get a feel for it. Bake each batch of rugelach for 15-20 minutes, till the edges and bottoms start to turn golden and cookies are baked through. Cool the cookies on a wire rack. This recipe will make several cookies, so Erika recommends freezing the ones you don’t eat up right away. Remember, they are great straight from the freezer! We have just returned home from Palm Springs, CA where we had breakfast at Sherman’s, purportedly a Jewish deli. Oy!!! We agreed that the bagels weren’t really bagels and left them on the plate. The biggest disappointment , however, was the rugelach! Sometime after arriving in this country, cooks started adding Cream Cheese to the dough rather than the more traditional oil or shortening. Thank you for posting a more traditional recipe, Tory. Like my grand-ma made. Happy New Year to you!! For anybody that is diabetic substitute a 1/4 cup of Splenda for regular sugar. Even though Splenda says use cup for equal cup, find it too sweet, and when I use this amount with my baking, everybody loves the products made, and coming back for more. Can be used for white or brown sugar. Hope this helps . Hi, love to try out new recipes, and new ways to prepare them. I’ve got a question for you. What can I substitute for raisins in the above recipe? Here’s my problem, I’m deadly allergic to raisins. Plus allergic to any pepper spices such as black, white, red, cayenne, paprika (but use turmeric instead of the paprika for recipes), sage, poultry seasoning, mixed spices that it contains. But can have the vegetable as long it isn’t spicy peppers, or has the which has the seeds removed from the regular green, red, yellow & orange colored vegetable peppers. Also no ginger in either spice form or vegetable. No watermelon, no whole wheat, or bran, crab or imitation crab which is cod, Pollack or haddock. But can have shrimp, lobster, scallops though. Can yous think of any substitutes I can use for my allergies? I would greatly appreciate any help I can get. Thanks. What a wonderful story of a family’s tradition! I will make the recipe in the morning for dh, but will substitute crannies for raisons due to the sugar content, and stevia for sugar. Sounds delicious and I will be making this recipe.I l enjoyed reading about your grandmother and it bought back so many fond memories of my grandmother Rose, who lived on Hinsdale St. in Brooklyn, N.Y. Thank you for sharing! I always enjoy your stories. I make my rugelach using the usual cream cheese dough. 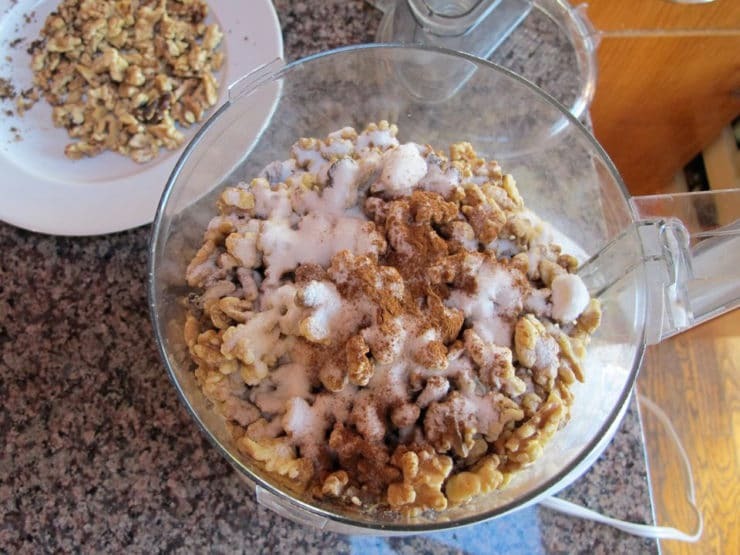 BUT – my filling consists of a mix of chopped walnuts, mini chocolate chips, cinnamon, a little flour and melted butter. Even though the filling is “chunky”, I am able to roll them the “traditional” way. Looking forward to reading more stories! Instead of the circle-crescent method of forming, might jelly-roll style work? I’ve used that for other rugelach recipes and it’s way easier. I may try it with half a recipe and if so, will report back! Yes, that’s how I make my rugelach too. I think slicing a jelly roll is easy and looks pretty. Just a thought…I made your sephardic charoaet truffles laast weekend, they were delish btw, but how taboo woukd it be add dates and dried apricots to this recipe? As long as they are chopped with a knife so they dont stixk together, but would this negate its rugelachness? 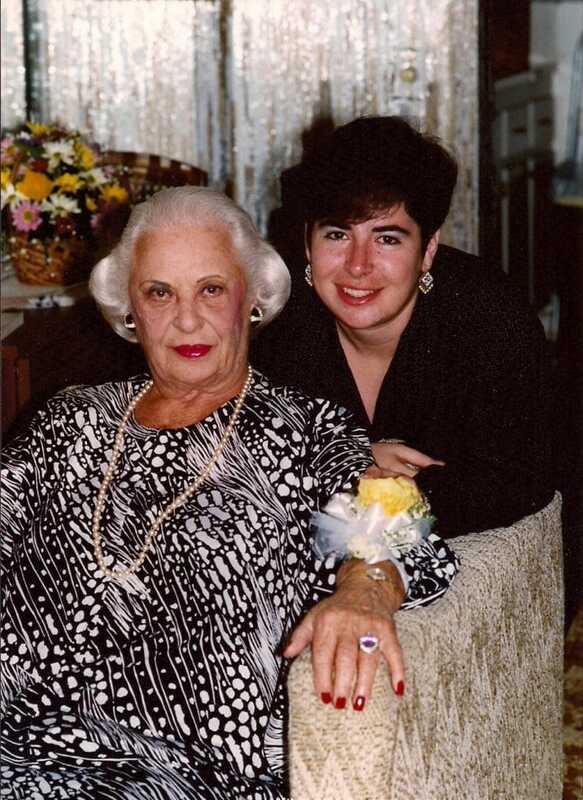 My grandmother who also was not Jewish…her self proclaimes cooking style was “a little bit of this and a little bit of that”. I guess as a shiksa mine would be called “shissahein”, excuse the spelling. I have it on good authority that its a Yiddish term for “throw it in” and thay describes me as good as anything. So, whaddaya think qbout the dates and apricots? I think it could be great! And not taboo at all. 🙂 Go for it! 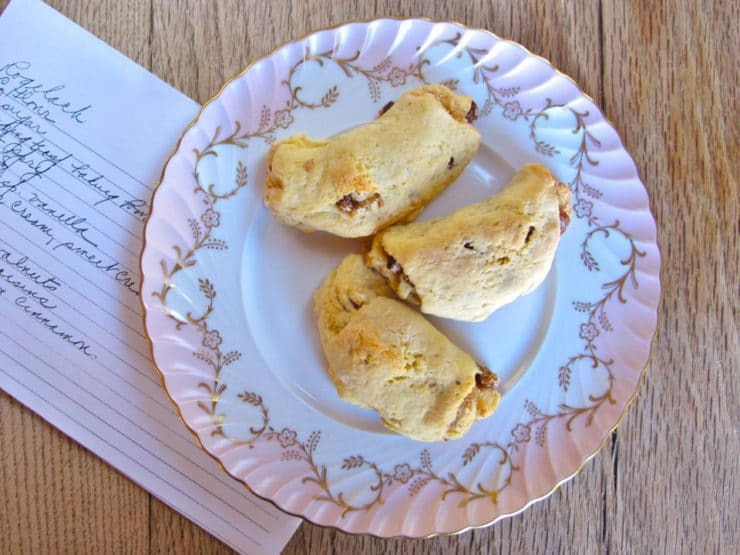 What a lovely story…I always enjoy a little family history and the story behind the recipe. Erika is indeed a kind and sharing lady, and it’s so wonderful her son will carry on the family tradition. I’m craving rugelach now! What a touching, interesting story about Erika’s family. I love seeing variations of traditional dishes, and rugelach is one of my favorites. Tori, beautiful post. I thoroughly enjoyed reading this post, it reminded me so much of my grandmother whose family came from Russia around the same time. She too was taught by family members how to cook. My grandmother taught me how to make rugelach, but I never saved her recipe. I can’t wait to give Erika’s recipe a try! Tori, thank you for writing such a beautiful piece about my family recipe. I’m not so sure about Emery carrying on the rugelach tradition – he doesn’t like sweets very much – but here’s hoping! I sure hope he does Erika! If not, maybe you’ll have a granddaughter someday that you can pass it on to, just like Rose did to you. 😉 Thank you so much for sharing! Thanks for this wonderful post. I really enjoyed reading about Erika and her family. I’m definitely going to try making these and I’ll be thinking Rose and Erika when I do.